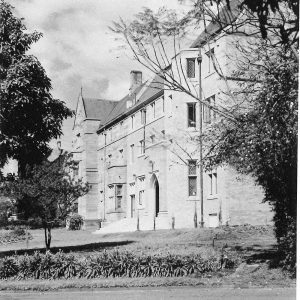 1956 – this year was marked by the deaths of five of the College’s Foundation Councillors: His Lordship Bishop Gleeson, the first Chairman, Dr Walter Burfitt, Mrs Anne Spruson, Sir Mark Sheldon and Dr Mary Burfitt Williams, all of whom had made significant contributions to the development of Sancta Sophia College. 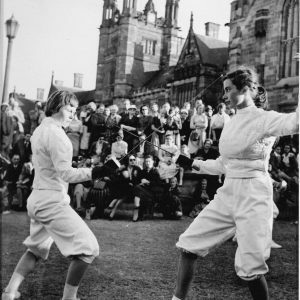 1956 – The 1956 Annual Report noted an unusual event in the College life that year; for ten days during the May vacation an International Women’s Hockey Tournament was played on the University Ovals, with Sancta Sophia and Women’s Colleges providing accommodation for many of the players and tournament officials. 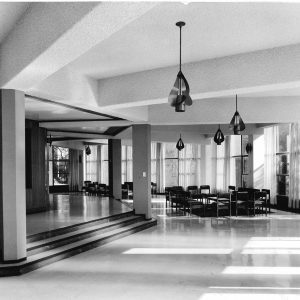 1957 – The Sheldon Dining Hall was completed and opened, a beautiful and dignified stained glass window added to the wall behind the High Table. 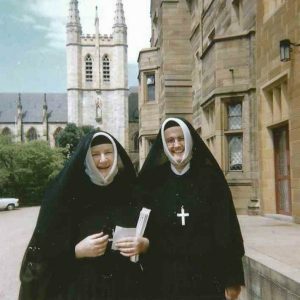 1958 – On 16 January, the Council of Sancta Sophia College, together with the Heads of the other Colleges, met at Sancta Sophia to farewell Reverend Mother Juanita Macrae, and to welcome her successor, Mother Yvonne Swift LLB. Mother Macrae had served as Principal since 1943. 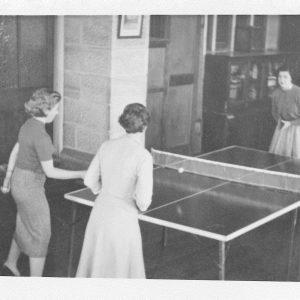 1958 – Sancta Sophia College and Women’s College contested the inaugural Macrae – Archdale Cup. The Cup was named after the two principals who had left the previous year, Mother Juanita Macrae of Sancta Sophia and Miss Betty Archdale of Women’s College. With victory in the swimming, table tennis, tennis and basketball Sancta won the Cup and the victory was celebrated with a Sports Cup Dinner. At the Council meeting on 27 November, the Chairman added his congratulations to the students on their success. 1958 – At their meeting of 27 November, members of Council agrees that there should be a closed night once a week, with all students required to dine in College on that night. Council also agreed that once a fortnight or so, a guest should be invited to dine at High Table and to speak to students during coffee afterwards in the Common Room. The councillors were of the view that the formal night was highly necessary for discipline. 1959 – Sancta won first prize in the Commemoration Day Float Procession with their performance of their skit on the Red Cross, dressed as Vampire Bats (the Red Cross being the charity for the year). 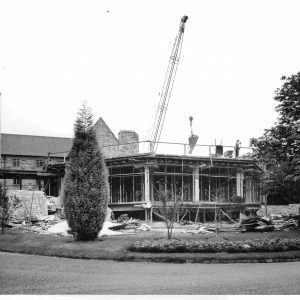 1959 – At the meeting of 5 March, Council was advised that the architect had been asked to draw up plans for a proposed extension to the College, including “a main entrance hall and staircase, a reception room, a large lecture hall to be used for tutorials, sleeping accommodation for about thirty two students, bath room block ad extensions to the Chapel and Library”. Work finally commenced on the extension on 21 December. 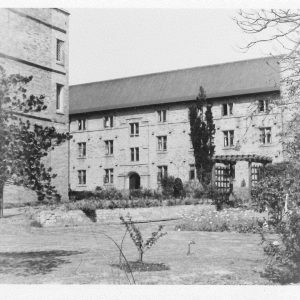 1961 – Lent Term saw the long awaited East Wing almost completed, with the first floor being occupied. On 31st May that year, His Eminence Cardinal Gilroy conducted the Blessing of the new wing. 1961 – saw the College enter the world of commerce, with the opening of the College shop two days after Easter. 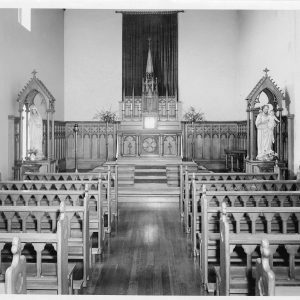 A fixture for several decades, the shop served to raise funds for the House Committee and was blamed by many for the on-set of the “Sancta spread”. 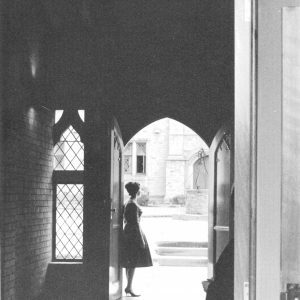 1961 – On 14 November, Sancta had a brush with international stardom, when the British actress Miss Vivien Leigh visited the College. The Dispense Journal entry for that day records that she “came for half an hour at 3.30pm. Fruit cup and afternoon tea of sandwiches and cake were prepared but she took nothing”. Ensuring nothing went to waste, Dora Bye and some of the students who came to meet her had afternoon tea in the Blue Room after she left at 4pm. 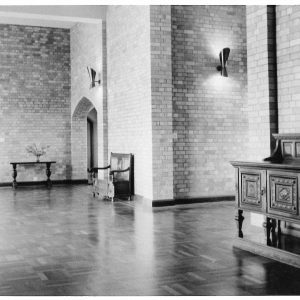 1964 – At the Council meeting of 7 March, Mother Swift reported that she had obtained, from the Australian Universities Commission, a copy of the working drawings prepared in 1960 for octagonal student blocks constructed at Ormond College, University of Melbourne. Although the minutes report that the College’s Architect, Mr Crocker, “had not seemed very enthusiastic”, contracts were signed later that year and work commenced on the construction of The Octagon. 1964 – The Second Vatican Council (informally known as “Vatican II”) was held between October 1962 and December 1965. Vatican II was a catalyst for a great deal of change in the way Catholics viewed themselves, their church and the rest of the world. 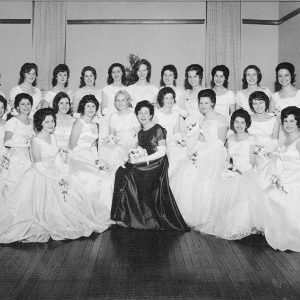 1965 – The end of enclosure for the nuns in the mid-1960s allowed Mother Swift and the other nuns to take their place more freely in inter-college and University functions. 1965 – Council approved, at its meeting of 3 June, the purchase of a car for the use of the Community, owing to the increase in attendance at University functions by the nuns, and the difficulty in obtaining taxis at night. Speaking in favour of the purchase, the Chairman Sir Charles McDonald said that he “thought that it did not seem right that nuns should travel on foot at night” and that “Council should encourage their attendance at University functions”. 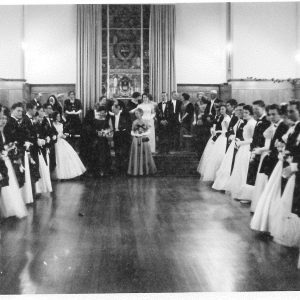 An increase in the attendance by the nuns at Graduation Ceremonies and other functions had been met with a marked change of opinion in University circles, and caused “very agreeable comment”. 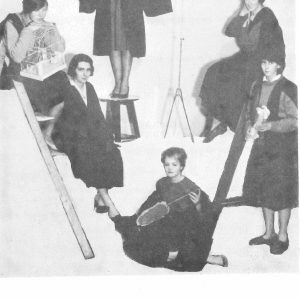 1965 – In August, the College hosted an art exhibition organised by Miss Barbara Lane-Mullins as a fundraiser for the continuing building program. Among the artists whose works were featured were William Dobell and Sidney Nolan. Mother Yvonne Swift LLB, the College’s 4th Principal (1958 to 1972), Mother Swift’s term coincided with a remarkable period in the history of the College, influenced by the post-Vatican II changes, a period of enormous social change, the building extension program resulting from increased Commonwealth government funding for universities, and Australia’s entry into the Vietnam War. Sir Charles McDonald, KCMG, nominated to Council in 1951, Sir Charles served until his death in 1970, including as Chairman from 1953 to 1970. Knighted in 1962, Sir Charles was appointed to the position of Chancellor of the University of Sydney in December 1964. A distinguished physician, Sir Charles saw service with the 1st AIF during World War I, in the Australian Army Medical Corps, and with the 2nd AIF, attached to the 2nd/6th Australian General Hospital, during World War II. He was Mentioned in Dispatches in June 1943. 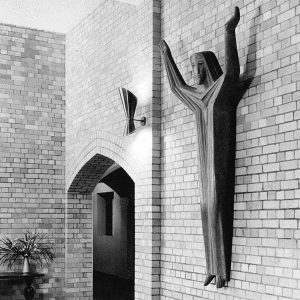 Father Roger Pryke was elected to Council in 1958, and resigned in 1973 following his resignation from the priesthood. 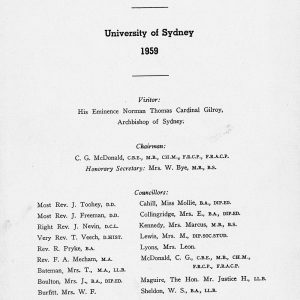 Ordained in 1944, Father Roger Pryke was appointed to the position of chaplain to Catholic students at the University of Sydney in 1951. In 1957, he commenced a course of lectures on Theology for nuns, which was offered in a residential setting at Sancta Sophia College. Implemented before Vatican II, these courses were a significant development in religious life for many participants, so when Vatican II happened, these women were ready for the changes it brought. A champion of the role colleges played in University life as a whole, he also contributed to annual retreats for students, and chaired Newman Society discussion groups at Sancta Sophia on Sunday evenings, providing a supportive environment in which students were free to question, challenge and learn.